UK Air Accidents Investigation Branch and satellite data from Inmarsat is the one responsible for the investigation that made Malaysian Prime Minister Najib Razak that MH370 did crash in the southern Indian Ocean. With the aid of Inmarsat, they have detected that the last position of the said jet is in the middle of the Indian Ocean and there is a very high possibility that the plane crashed there. This is according to Najib. 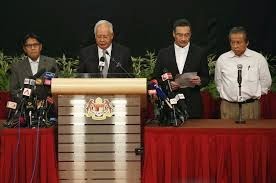 He also said that Malaysian Airlines officials have communicated with the families of the passengers of the said airplane in order to inform them of the updates of the investigation wherein several countries around the world have joined hand in hand in search for the missing plane. Everyone was puzzled with regards to the plane that was missing for more that 2 weeks already and it is agonizing in the side of the families of the passengers who are still hoping that they are safe and that the plane would come back soon. Since this is a difficult time, the Prime Minister asked the media for privacy in the side of the family of the passengers. The plane has 226 passengers and 13 crews have urged everyone around the world to offer a prayer. The case of the missing plane is something so stirring in the hearts and minds of the investigators since there are so many theories coming out regarding the vanishing of the plane. And since an investigation with the use of Inmarsat is clarifying everything, a pour out of emotion happened in the Chinese embassy. The plane is dominated by Chinese passengers. The Malaysia Airlines assured the families of the passengers that they will give their full support to them with regards to the issue. It is believed to be that the plane went down and there was no survivor left, though some are still not convinced that the signals taken by Inmarsat are really from MH370.